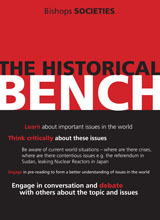 The Historical Bench is a society at Bishops that was established in 1999 by Dr Paul Murray on the advice of Mr Michael Fisher who was the Head of French at the College from 1958. The Chairman recommends reading material on a topic chosen, and then the meeting follows with meaningful discussion. It has a membership of around 25.